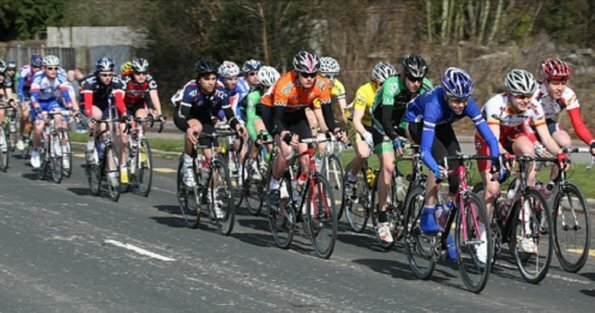 Matt Myers, Alex Pantelides, and Declan Higgins all took part in this traditional opener to the National Junior RR series. 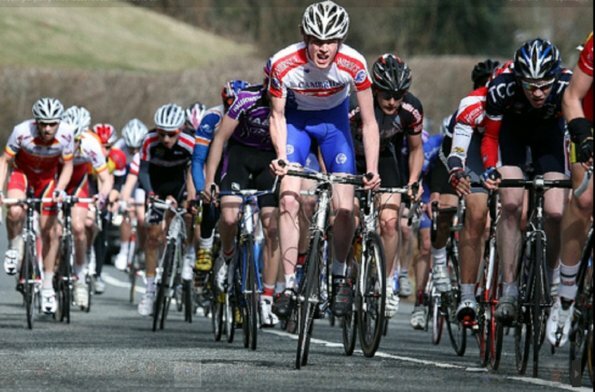 "Lining up at the start in the bright sunshine with my carbon wheels and Twickenham jersey at the first National Junior Series race with many of the top juniors in the country. So it wasn't surprising i felt like it was going to be a good race. So as the pack rolled off out of the carpark of the Abergavenny Sports Centre I had time to chat to chat to friends of previous trips to Belgium and generally relax into the start of the 3km neutralised section. The race started in earnest, moving through the bunch to settle comfortably in the top twenty of the 80 man race, I sat back as I saw Alex try and get into a move early on but to no avail. Then after numerous attacks and feints a small group went off the front and the peloton allowed it to stick, by this point in time people were getting shelled out the back left right and centre and by the time we reached the top of first 2.5km climb (at av 10%) it looked like a bomb had just blown the peleton apart. Riders off the back and bikes wobbling from side to side up the climb. I was lucky to still be at the front and moving the pace along (I didnt see Alex or Declan after this point so I cant really comment on what happened in their races) feeling out of breath but in control. The pace was still rapid on the following descent down the welsh valleys and before I knew it we hit the monster climb of the day up Devaulden, I tried to get a rhythm going but I was happy to see the grimacing faces around me which meant I wasn't the only one suffering!! Over the top of that climb we came but then a large group slipped slowly off the front, not an attack as such but just a gradual move away. The people at the front of our group kept looking at each other to see who would chase. There were some concerted efforts to bridge and I had a go with another rider but to no avail. So by the time it was 15km to go of the 102km race we were still trailing the small pack infront (about 12 riders) by about 30 seconds. The pace was vicious down the descents and we were going over 65km/h at some points so it was no surpise that coming round a hairpin someone would misjudge their line. Unfortunately for me that person was riding in front of me I had to brake hard to stop crashing into him, I locked up my back wheel in the process and the tub on my back wheel rolled off jamming the wheel. 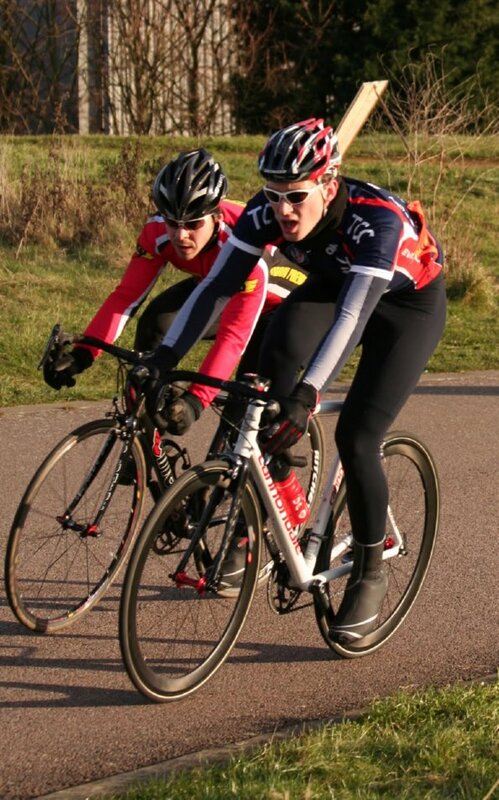 And thats when I came off, skidding for about 10m, luckily my bike was alright though I had bad road rash down my side. I thought about getting back on and chasing but by the time I had rolled the tub back on the others were a mile away. I didnt feel so bad as I saw the guy who crashed infront of me down into an adjacent field had broken his arm with an ambulance in attendance. was a real shame to end my race like that as I was actually feeling good and thought about a top twenty place, unfortunately it was not to be. 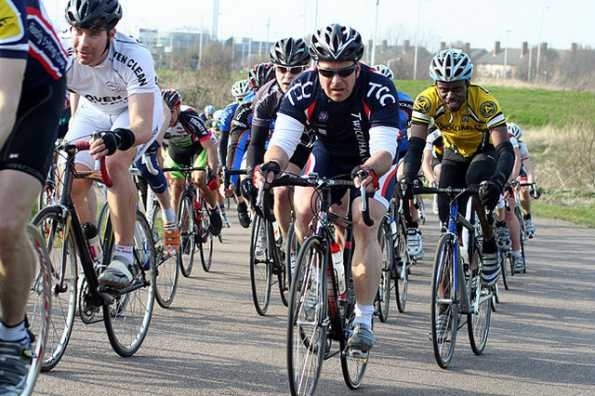 I am sorry I couldnt carry on the Twickenham tradition of winning Cadance (as Sandy did last year) but I had an enjoyable race anyway and look forward to flying the Twickenahm flag at at many more races this year, hopefully staying on two wheels next time!" 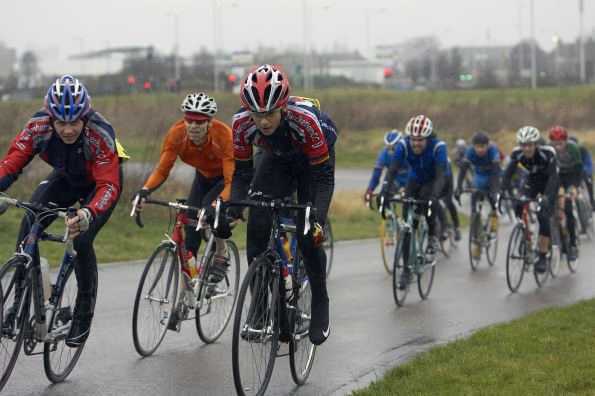 "The weather was terrible at Hillingdon for my first race of the season and first race back after crashing out of the Club Championships. 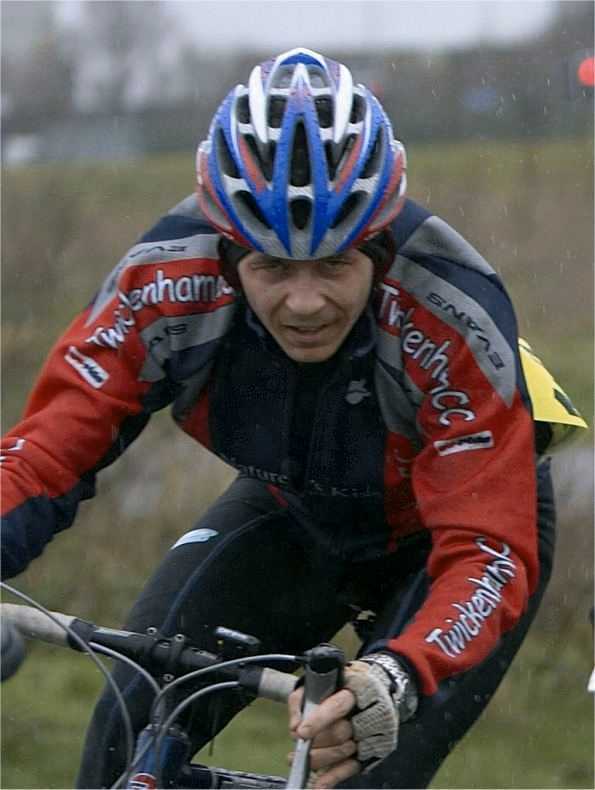 Myself and Tom Bell were the only Twickenham representatives, but there were quite a few ex TCC riders in the field Corrine Hall, Bill Butterworth, James Leach and Will McFarland. 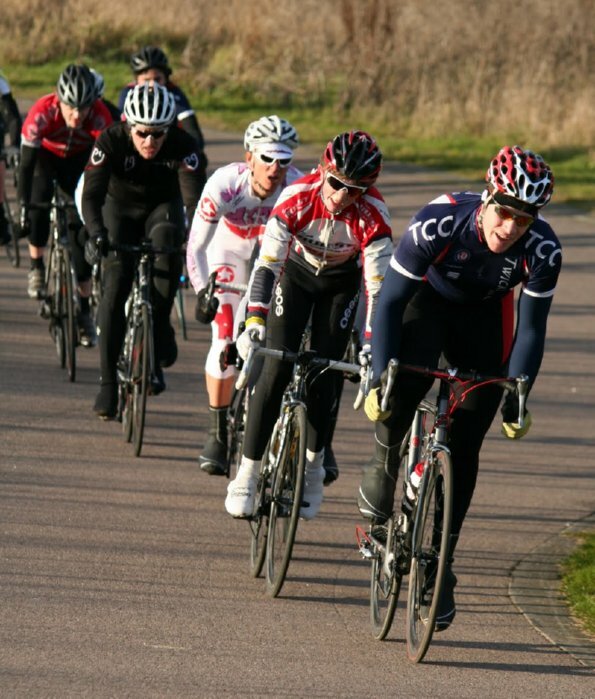 The race started fairly steady and I found myself on the front in the opening lap. A couple of laps later Tom Bell went clear and was away for a few laps. After Tom got caught attacks were going in all the time but no one was able to get away. I moved myself forward in the last few laps. With a lap to go there was a split in the string and I was caught on the wrong side of it. There wasn’t enough time and I wasn’t strong enough to bridge it on my own. Half a lap to go and we were just approaching the back of the split who had eased off a bit. Coming onto the finishing straight I couldn’t unleash my full sprint because of the amount of riders in front and around me. I came across the line somewhere around 20th-25th, 10 meters after the line some idiot put his brakes on and swerved to the right taking myself and another rider off and we slid across the tarmac. No serious damage but some heavy bruising and stiff muscles. Some minor damage to my New Bike but only aesthetically. Thanks to Des Gayler and the Girl who was doing first aid for taking care of me afterwards. I’m very disappointed the race had to end like that as it was really good to be racing again after a 6 month absence. It’s going to be a long season.........."